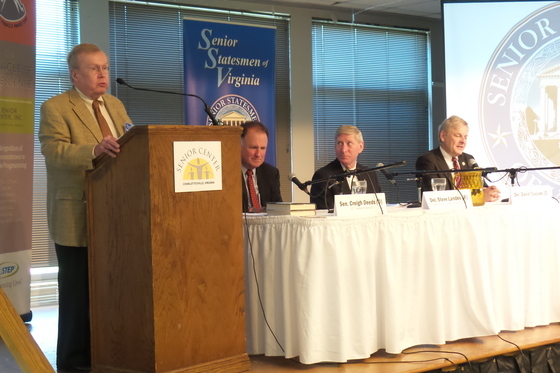 Area legislators reported on the 2017 Session of the Virginia General Assembly. This was the biennial “short” session when the focus is normally on amending Virginia’s two-year budget. Because revenues were greater than expected, the budget amendments were adopted with little strife. The record on other issues was mixed. For example, bills to reform the redistricting process and end gerrymandering, which passed the Senate overwhelmingly, were killed in an early-morning House subcommittee meeting. The three below spoke at our Wednesday May 10, 2017 meeting that was moderated by SSV board member Terry Cooper. Download a PDF of the PowerPoint presentation and listen to the podcast for details. Senator Creigh Deeds (D) represents the 25th Senate District which includes the cities of Buena Vista, Charlottesville, Covington and Lexington, and the counties of Albemarle (part), Alleghany, Bath, Highland, Nelson and Rockbridge. Delegate Steve Landes (R) represents the 25th House of Delegates District which includes portions of Albemarle, Augusta and Rockingham Counties. Delegate David Toscano (D) represents the 57th House of Delegates District which includes Charlottesville and part of Albemarle County. Senator Creigh Deeds and Delegates Steve Landes and David Toscano presented a report on the 2017 General Assembly session. Delegate Toscano utilized a PowerPoint presentation (click here to download a PDF) to highlight the actions taken during the session. The state of play in Richmond is conducted in the context of a divided government with the legislature controlled by Republicans and the Executive controlled by Democrats. Virginia has enjoyed an improving economy with the unemployment down to 3.9% from 5.4%, second-lowest unemployment rate among major U.S. states; and investment in ports and Dulles. Yet the income inequality gap continues to grow. Of the 1,817 bills and resolutions introduced, 1,243 of these passed. Delegate Toscano identified 10 successes in areas such as combating opioids, encouraging solar power, increasing judicial discretion and addressing mental health issues. Areas of disappointment included the failure to achieve any improvements in health care and redistricting reform. Delegate Landes distributed copies of “Sessions Highlights,” and then discussed the 107 billion dollar biennial budget which included a reduction of 61 million in debt and added 35 million in cash reserves. Although there were no tax increases, he enumerated a number of important programs which received increased support. Unlike the federal government, Virginia cannot print money but rather must have a balanced budget. The bond-rating agencies are looking at how Virginia is handling the rainy-day fund and so this will be a continuing concern moving ahead with future budgets. Delegate Landes detailed several bills that he worked on in a bipartisan manner that were directed toward strengthening the economy and were signed into law. Senator Deeds began his comments with the astonishing reminder that in 1940, Virginia’s two most populous counties were Pittsylvania and Wise, and the state’s economy was natural resources: coal, tobacco and textiles. Our economy since then has been driven by the military-industrial complex—federal spending—with growth in Hampton Roads and Northern Virginia. Sequestration at the federal level over the past nine to 10 years requires us to look at new ways to promote economic growth and spur a creative environment conducive to economic growth. Senator Deeds also described his ongoing efforts to improve the system of care for persons with mental illness. Virginia continues to direct the major share of its resources to support the state institutions rather than community-based services. Sixteen percent of the persons in our prisons are seriously mentally ill and 24 percent in local jails.